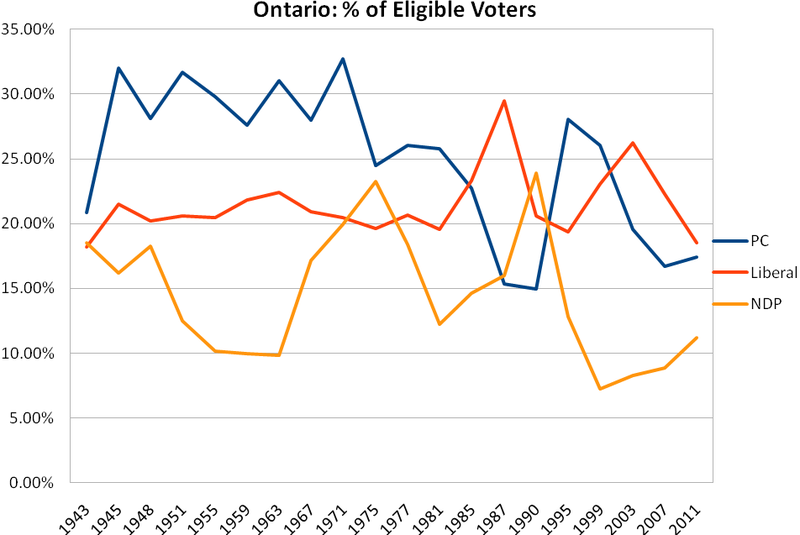 One of Ontario’s 3 main political parties had a lower percentage of eligible voters opt for their party than had been the case since 1943. Reported preliminary figures show Dalton McGuinty's Liberals won 53 of Ontario's 107 seats by collecting 37.62% of the 49.2% of possible electors that bothered to vote. That's the lowest share of electors who chose the Liberal party since WW II. The first lesson for the Progressive Conservatives is that the Liberals weren't relevant in their loss. Voter turnout has been declining for some time. Federally, 2011's election saw a bump up, as did 2006's. The first saw the end of 4 consecutive Liberal governments, and the second saw a Conservative majority. Looking at a chart of election turnout in Canada, the two greatest increases in turnout, over the past century, are 1957, and 1984. The first is Diefenbaker's Tories end of Liberal rule, the second is the first of Mulroney's two massive majorities. Two of the 3 greatest declines are the preceding elections of 1953, and 1980. Put another way, both of the largest increases came by voters returning after skipping elections. The Liberal party has been frequently described as Canada's natural ruling party. That might say more about Canadians' penchant for being ruled than it does about the Liberal party. The big decline of the past 2 decades occurred under Chretien's 3 consecutive majorities, from 1993-2000, which saw voter turnout decline 5.7%, 2.6%, and another 5.75%. Chretien's only legacy is his 3 consecutive majorities. 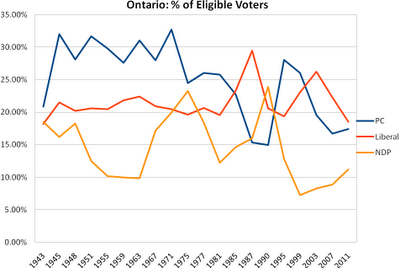 Ontario's graph shows similar declines in turnout - but the years are offset from the federal chart. Well ... optimistically the years are offset - the trend now is simply down. Historically we see a couple of trends, including the big jump in turnout for the 1934 election, of Liberal Mitchell Hepburn, being preceded by a drop in turnout in the 1929 election (which had re-elected Conservatives). Then we see the steep turnout drop in 1943 as the Liberals are bumped from their 2 majority terms, in the election they last collected a lower share of eligible votes than in 2011. The following election saw a big upswing in turnout for what would be the first of 7 consecutive Progressive Conservative majorities. The 1971 uptick is the first election under PC Leader Bill Davis. The common narrative is that Davis re-united factions of the party in building the 'big blue machine' that would run 4 undefeated election campaigns. In my analysis of percentage of eligible voters, Bill Davis is the precedent for Dalton McGuinty. In the second election he ran, voter turnout was 5.7% down (dropped to a minority), then another 2.2% drop (another minority), and then a 7.6% drop in voter turnout would lead to his second majority. Between 1971's majority and 1981's majority, the Davis PC's had dropped from winning 32.7% of all possible votes, to only 25.7%. The drop in turnout in 1981, while providing a majority, also proved to foretell the end of PC rule in 1985. Since the McGuiinty led Liberals were fist elected, to now, the drop in percentage of available votes dropped from 26.3% to 18.5% - a very similar drop to the Davis PC's. People don't need to vote against anything. The minority Liberal government is at long-term lows in support. People don't need to vote at all. Many don't, when not provided a reason to do so. People would like something to vote for. When a viable alternative presents itself, they will.